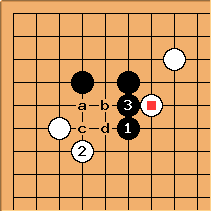 The textbook example of a sake bottle shape is this position, where Black must avoid being shut in, and chooses between a, b and c. Black at c is emphasised as an example of good shape. here is a 'tempting the opponent to cut' play. is a standard shape. In relation to making a double peep next at b, it is correct. 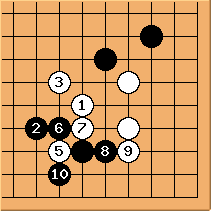 Also one sees this kind of diagonal in other cases, for example easy way out of a double kakari, when the immediate threat to cut doesn't work. White shouldn't play at and cut off , because bad things will happen to her stone on the left side. So then , and is honte: good firm shape. 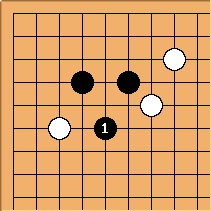 Black will welcome this if he can attack on the upper side. 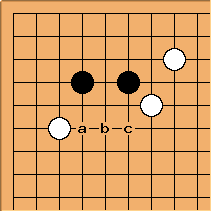 This is clearly another way to create good shape: with a table shape Black feels confident defending here with good follow-up plays at the bulge point a and out into the centre. Traditionally go teachers have discouraged this sake bottle shape. It is less obvious that it works well, analysing it as functional shape, or in terms of attack and defence. 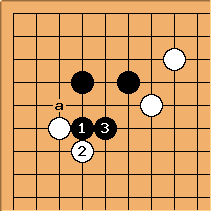 It has been played by a couple of top players, notably Ishida Yoshio who is quoted in a Go World article as saying that it really doesn't lose anything. Charles Matthews. His answers to Sebastian's questions turned into plain text by Dieter in the process of a WME.